Satisfying both oenophilic and al fresco obsessions with simple elegance, this portable wine picnic table provides a stable place to set two wine glasses, along with a small table to set snacks. 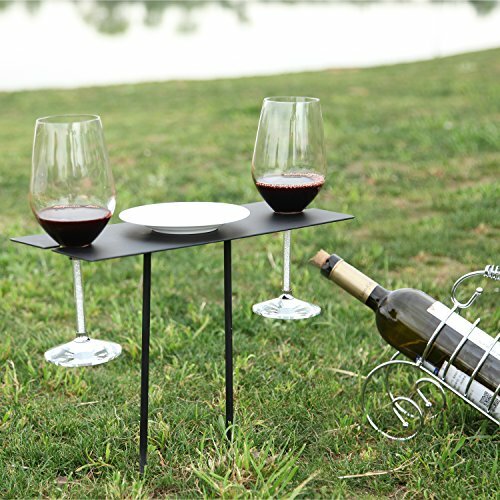 Made of metal for durability, this stemware stand features detachable legs, allowing it to break down for portability. At the picnic site, simply screw the legs on to the table push the legs into soft ground, and enjoy. Make any picnic location fine for wine with this convenient metal wine glass and snack table. Black metal portable picnic table with spiked legs and cradles for 2 wine glasses. Legs unscrew from table for portability: to use simply screw legs to table and push into soft ground. Provides a secure and stable place for 2 pieces of most types of stemware, as well as a small table for snacks. Wine cradles measure approximately 1.2 inches in diameter; stem slots measure approximately 0.5 inches wide.